I did a search and couldn't find any existing topic about this that was recent. I'm sure this map has been posted before but I thought it would be useful to post it and its source in a thread dedicated to the topic. 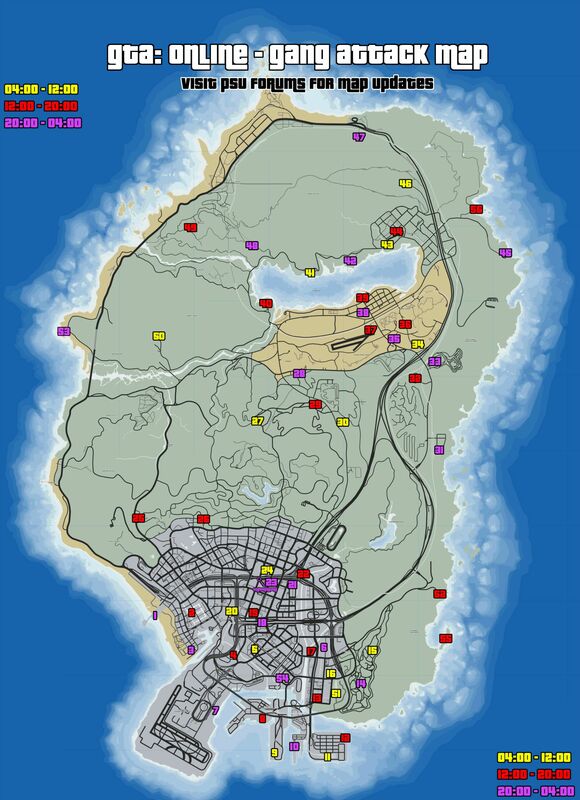 This map that is shared and maintained on the Playstation Unverse forums (here: http://www.psu.com/forums/showthread.php/318975-GTA-Online-Gang-Attack-Map), shows where all the Gang Attacks are. I was not able to find two of them though. #25 and #46 didn't appear at the times prescribed. I'm on XBOX and I wouldn't think they would be different across platforms. Has anyone on XBOX used this map and found discrepancies? Has anyone had experience with clearing out the gang attacks at #25 and #46? You usually can't trigger the gang attack when you have police stars on you. Lose them first. I had some trouble with triggering #49 to start as the residents of the commune would attack me and if I attacked them back I would get stars. If you have this problem, try walking in unarmed. Thank you so much for this! been looking to find more gang attack area's to complete them all and to earn some easy RP and $ when in solo session. I used this map to complete every gang attack over a couple days. I believe the 2 your having trouble with have been moved ( see the update on that site) and that 56 has been taken out. #23 you have to go pretty dep into the underground tunnel and follow it till you reach the station. * If you cant get the red blip of the first gang member to show just walk around till you see a crate and the music will start. Shooting any gun now will start the gang attack. I had no idea there was that many gang attacks. This is a good one. There's another floating around that seems to be the "incomplete" version, didn't know there were more myself until I saw this. I was advised and it's true that 53 is the easiest way to get a Merc Mesa too. Indeed it is. usually a roofless and roofed side by side And it's also incredibly easy with only 10 mercs to kill. I should probably get on some Gang Attacks too haha. I've only done a handful. oh sweet. was thinking i should look for one of these soon... and here it is. i forgot what topic it was but a discussion about cops and gang attacks came up and i can confirm that you can make cops fight the gang attack for you. one with pistol other with pump shottie. 911 wont pick up while the cops are alive but the second the last cop dies you can call more police to the scene. There is an entire thread dedicated to the Gang Attacks, with videos in the Guides & Strategies section of this forum. perfect, just what ive been looking for, nice one!